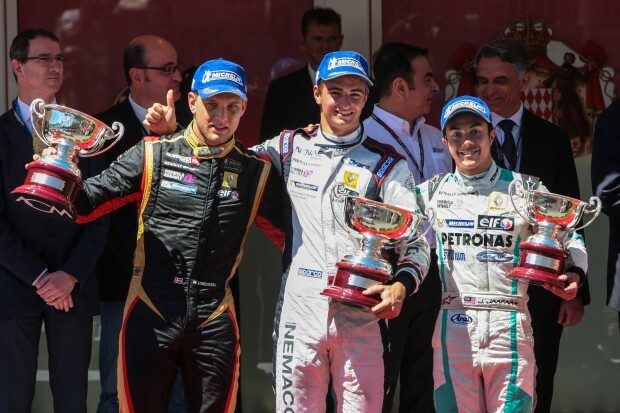 Jazeman Jaafar raced to a superb third place finish on his debut at the Monaco race track, taking the podium finish in the third round of the Formula Renault 3.5 Series at the most famous event on the motorsport calendar, the Formula One Grand Prix of Monaco. It was a very strong weekend for the young Malaysian driver, with Jazeman being the pace setter at the start of practice. He ran consistently among the top three during practice, just dropping a few places towards the end of the session as there were a couple of yellow flags, to finish seventh quickest. Jazeman continued with his impressive form in qualifying. With the field split into two groups the PETRONAS Talent Programme driver was in the first half of drivers to take to the track and quickly settled back into his front-running pace. He used his two sets of new tyres to good effect, topping the time sheets on each run to finish the session at the head of the times for his qualifying group, which secured him a front row slot for today’s race. The second group of qualifiers, running later in the morning, had warmer temperatures which led to quicker times, so Jazeman lined up in second place for his first race at the Monaco street circuit. The Monaco skies were blue and clear for the start of the Monaco round of the Formula Renault 3.5 Series with the PETRONAS-liveried Carlin car piloted by Jazeman gleaming on the front row. As the five red lights went out at the start Jazeman made a good start, with pole-sitter,Nico Muller, slipping into the lead. However, third placed starter, Marco Sorensen, made a lightning start to jump Jazeman in the first turn and steal his second place. Jazeman settled into third place and was keen to move back up to second, but the notoriously difficult track for overtaking offered limited opportunities for the Malaysian. After 32 laps around the streets of Monaco Jazeman crossed the line in third place to take his maiden podium in World Series by Renault, an excellent finish to the weekend for the young driver. Jazeman will have little time to enjoy his success as he prepares to head to Spa for the fourth round of the Formula Renault 3.5 Series which takes place next weekend.